... to be thinking about Christmas? Sorry, I know that's a dreadful thought! Most years I wouldn't even be mentioning the "C word" for another month or so, but this year I'm going to be teaching a few Christmas related sewing classes so I've had to make samples so the classes can be advertised. 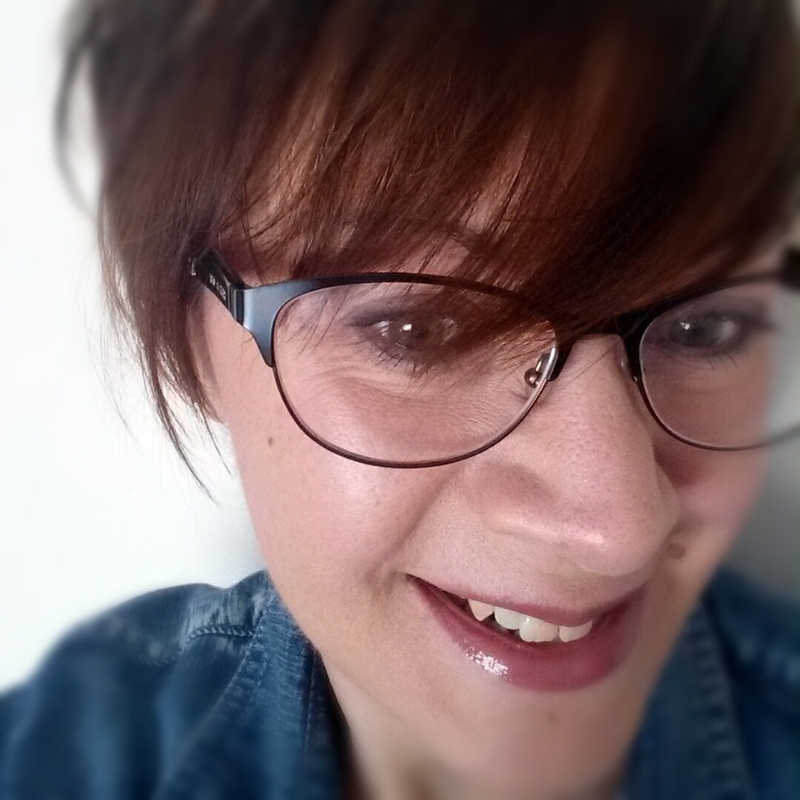 I'm really excited about the classes, so I thought I'd tell you a little bit about them and show you what I've made, just in case you're mad enough to be getting started early on your Christmas sewing. At Fabric HQ I'm going to be teaching a Party Frock class. Over 4 Saturday afternoons we'll use the Alison Glass Woven Essentials pattern to make a party dress. We've chosen this pattern because you can mix and match sleeve styles and different skirts to come up with a variety of different looks. I've made two samples for this class, and they couldn't be more different. I made this dress first. 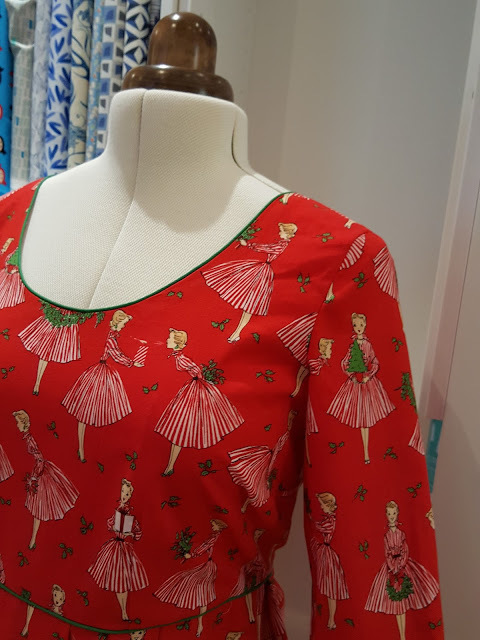 I used Michael Miller's Holiday Hostess fabric for this, and took the 3/4 sleeve option and the gathered skirt. I actually ended up loosely pleating the skirt instead of gathering it as it looked far nicer that way. 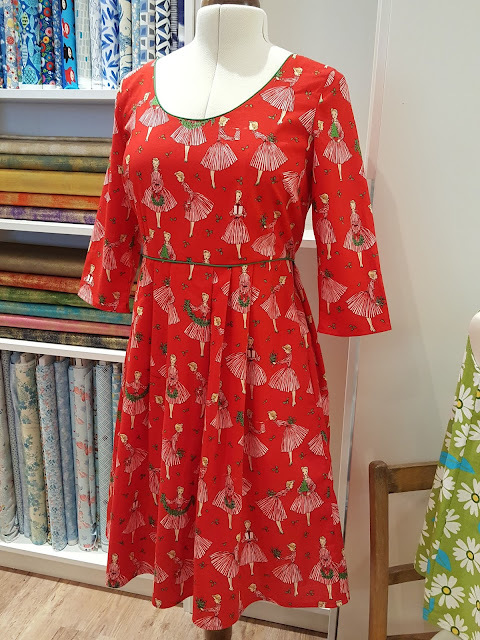 Given my obsession with piping, I couldn't resist adding green piping to the neckline and waist to pick out the green in the fabrics print. My husband hates this dress! When he saw it hanging up in the bedroom his first words were "You're not going to wear that are you?" However, he loves the second sample I made. For this one I picked the short sleeves - shortening them even more than the pattern - and the A-line skirt options. 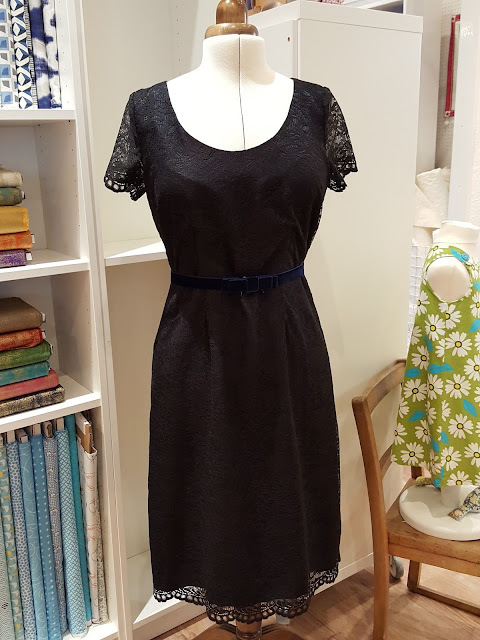 The fabric is dark navy satin with a black lace overlay. I also made a belt from navy velvet ribbon. This picture shows the navy under layer much better. 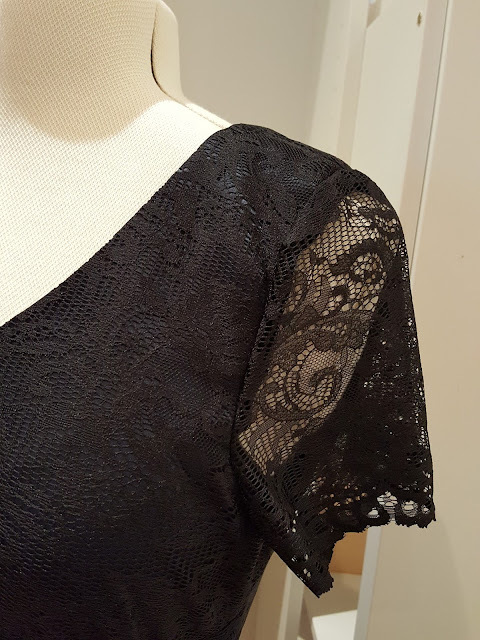 As you can see I used the lace on it's own for the sleeves. I think this will be a really fun class, and I can't wait to see how many different dresses we get from the one pattern. I've used this pattern once before I made these two dresses and I know I'll use it again. I've got plenty of hacks up my sleeve! 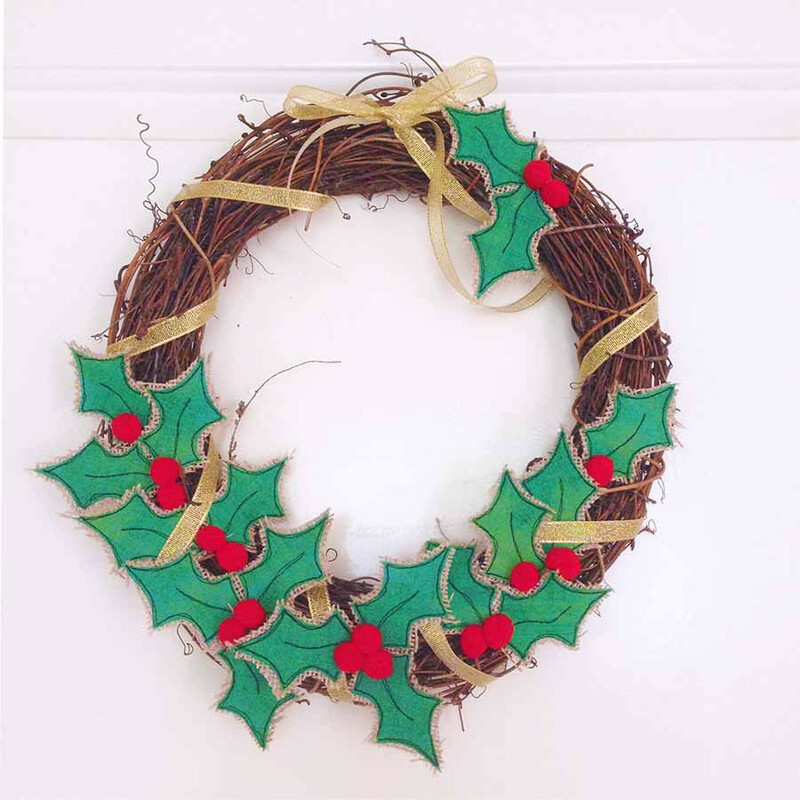 I'm also going to be teaching some Christmas themed free motion embroidery classes, specifically making this Christmas wreath. I'm teaching this class in several places, Fabric HQ, Crafty Angel Sewing Studio and Niko Brown gallery on various dates in November and early December. For these classes, we'll be providing all materials needed, so all you have to do is come along with your sewing machine and have fun! You can choose to make either a holly or a mistletoe wreath. I love them both. 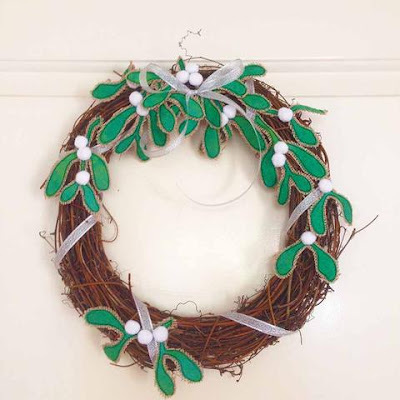 Now I've got the Christmas word out there in the open, tell me, have you started making things for Christmas yet? Are you going to? I'd love to know what you're making. Hahaha, my husband would say the same! But Christmas is meant for fun! Between November 7 and boxing day, I have 3 birthdays and Christmas for a family of 5 to get through, so I started Christmas making and purchasing last month. We'll be travelling so I've had to think of lightweight gifts, which means dolls clothes are my diy project this year. I don't think I need to do any Christmas dressmaking this year - it will be a warm Christmas for us and our wardrobes are fully stocked with summer gear, so we are ready on that front. A cold Christmas would have been a different matter though. Good idea starting early when you've got all that to manage! Dolls clothes sound like a lovely gift. We don't really ever have the need to dress up over Christmas - and this year we're going to be away for the first time, in Cornwall, where I'll probably need walking gear rather than a posh frock - so I think I'm covered. a party frock class, what a brilliant idea!! I love the fun fabric of the first sample you sewed, it looks amazing. And the black lace, so chic! And the wreaths look great. I'm totally excited for christmas this year, I think it's because I've been knitting mini stockings all year long!